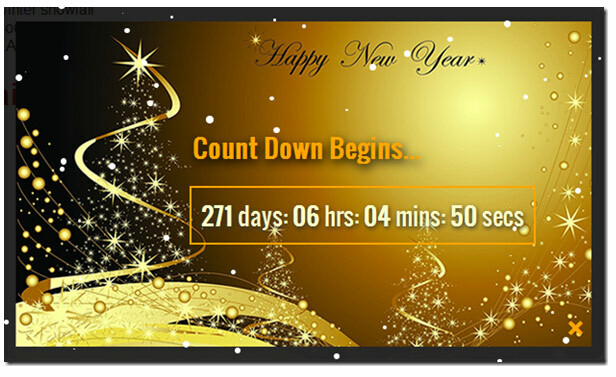 Happy New Year - jQuery Popup For Sites! Time fly too fast! Two years back we released a combination of 2 different popups to wish your website visitors happy winter holidays and happy new year, we are releasing today a dynamic popup for new year so that you may not remain dependant on a fixed background theme and instead change the date and time by editing the text. This Popup plugin contains 4 Unique Features! Supports HTML5 sessionStorage functionality to set cookie in order to control the popup display. You can choose to show the popup once or several times. It is perfectly compatible with all major browsers. A perfect way to greet your website visitors. You can add it easily to your blogspot or wordpress blogs or on HTML webpage you may have. It is extremely easy to customize. View the demos below and then proceed to the installation guide. How to install this popup? All steps are exactly similar to the ones we already shared on our christmas popups tutorial except for the styling which I will discuss here. Kindly therefore follow all steps shared in the Winter Holidays tutorial linked below. Follow all steps there and skip step#5. READ: Winter Holidays Popups with 2 amazing skins! This code is given in step#4 of previous tutorial. "Spending more time with my newly born baby "Ifza" and ofcourse blogosphere." Muhammad Mustafa Bhai, You are my most favorite blogger from Pakistan :) Allah bless you sir. Just one Word = WoW..!!! A good approach with coding. After seeing live demo, I must say golden color really attracts our eyes.